You can travel a lot and still never think about West Virginia. We live in Tennessee, and travel to states in all directions, mostly north, south and east. WannaBeatle Dennis grew up in Long Island, and his parents now live in Florida. WannaBeatle Nathan grew up in Vermont, and has a daughter in school in D.C.
WannaBeatle Dave was born in Cuba, then grew up in Florida. His son is in college in Chicago, and his daughter in North Carolina. WannaBeatle Bryan is from Georgia, but has a daughter, son-in-law and grandkids in D.C. The WannaBeatles have travelled to Kentucky, North Carolina, South Carolina, Georgia, and Alabama to play our shows. None of that travel has included the state of West Virginia. It seems to be located in a twilight zone of lost highways and mysterious state lines, which never appear in most people's consciousness. It's the geographical equivalent of some obscure organ we can't locate, like the spleen or thyroid. But this weekend was different. We're drove up to Parkersburg, West Virginia, so now we know it exists. It helps to have a personal connection. Your blog host Bryan has worked over the years in Nashville with a local bass player named Debbie Bailes. It was only recently that I discovered that she grew up in Parkersburg, West Virginia. When she found out the WannaBeatles were playing up there, she called her sister and brothers, and told them about our show, and they all bought tickets and came to see us. Not only her sister and brothers, but also a nephew and his wife, and another sister-in-law. To give it an extra bit of Beatles flavor, Debbie's sister is named Judy, but Debbie has always called her Jude. Debbie asked me if we could dedicate "Hey Jude" to her. We spent most of Friday getting there - up I-65 into Kentucky, taking the Bluegrass Turnpike over through Lexington, where it connects to I-64 into West Va., turning north at Charleston on I-77, to Parkersburg on the Ohio River. With Nashville included, we passed through both Frankfort and Charleston, which made three state capitals we hit during the trip. We stayed in a Red Roof Inn, two guys to a room. 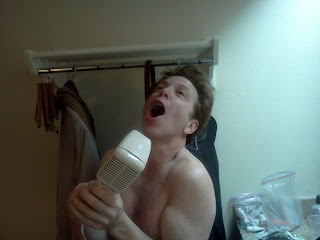 Dennis noticed the hair dryer resembled a classic retro microphone, so he couldn't resist singing into it as if he were Elvis. When the other WannaBeatles saw the photo, they admired Dennis's nice arm muscle, which looks like a blank canvas. They suggested we offer our fans a chance to design a tattoo for Dennis's arm. It could be a favorite sports team, rock band, motorcycle logo, or religious icon. We could keep track of the suggestions with a page on our new website. David suggested calling the contest "Rent a Spot on Dennis Scott." This happens to be the week that our new website went public, so we're constantly thinking about ways to "engage" people with social media. Sometimes it seems like our ideas are too far ahead of our ability to implement them. But still, feel free to make suggestions. Saturday afternoon, on our way to the campus, we turned the wrong way off I-77, and saw a bit of local culture. If you can't read the sign, it says "Hillbilly Sandwich Shack." After that wrong turn, it only took one cell phone call and a few minutes to get us to the campus of WVU. There were students to help us load in, and a very nice local promoter named Scott who made us feel welcome. We brought our video screen setup, which took extra time to rehearse, but the staff at WVU really handled it well, and it went without a hitch. They had a large white screen for our various video images. 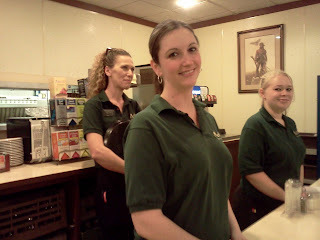 After the soundcheck, we went to a very friendly local restaurant called the Mountaineer Family Cafe. We learned that they're famous for serving the best liver and onions in the area. We declined that dish, settling on pasta, country fried steak, and the sort of fuel we'd need for a two hour show. We enjoyed meeting Marcia, our friendly waitress, who besides working at the restaurant also teaches deaf children American sign language. Marcia and co-workers at Mountaineer Family Cafe. Back at the campus, there were over 200 people in the auditorium, and they enjoyed the show. We had lots of fans get up to dance, and a little boy named V.J. joined us onstage to sing "When I'm 64." 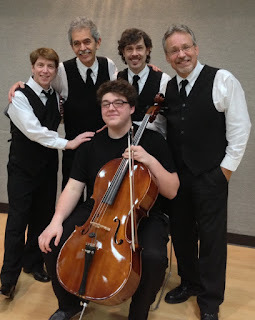 Another treat was a local cello student named Ryan Phipps, who joined us on several songs, most notably "Eleanor Rigby" and "Live and Let Die." He's 16, a junior in high school and a fine player, already 3rd chair in the All State Orchestra. He really gets a great sound of the instrument. We also met his dad John, and younger brother Scott, who plays cello and drums. After the show, I got to meet Jude and all of Debbie's family who came to the show. We got a nice photo of her two brothers, David and Gary, along with sister in law Kandi, nephew Sam, and daughter in law Kendra. We finished the evening with milkshakes at Wendy's, while reading facebook posts on our cellphones, checking out comments on the show. We've been playing music for a long time, but never had such immediate and widespread connection to our fans. 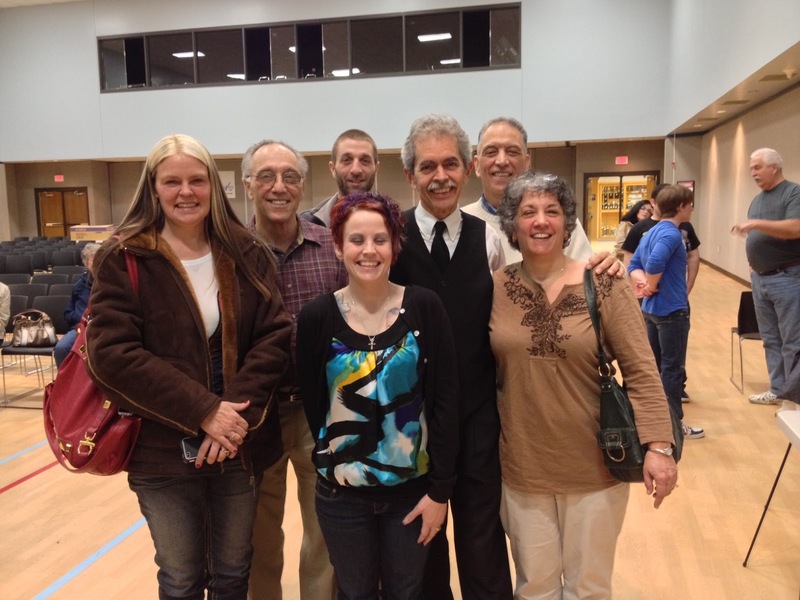 We enjoyed Parkersburg, and hope to come back soon. We even wrote some songs while we were in the motel, and in the van. One is called "In '63" and the other is called "New I.D.," which is based on Nathan's experience of losing his wallet, and having to get a new driver's license. You'll have to wait till later to hear them. And think of a funny tattoo for Dennis's arm. It may be the only thing missing that turns him into a total rock star. The new website is active, and David's quite proud of it. He worked about three weeks on it, while continuing all his other teaching and playing obligations - we're blessed to have such a brave technical explorer in the band. Visit www.thewannabeatles.com and see what you think. The WannaBeatles are the subject of a documentary film, which was made by Stanley Karr, currently a senior at Nashville School of the Arts. Stanley has been into film making and performing arts for most of his life. He was born in Nashville, then moved when he was 3 with his family to Maryland, where he attended a summer performing arts camp in Bethesda at age 6. Inspired by Disney movies, he was drawn into film production. Returning to Nashville at ten, Stanley participated in Kids on Stage (KOS)(www.kidsonstagetn.com), a summer arts camp in Lieper's Fork, where he learned camera techniques, lighting, sound and editing from director Rod Daniels. He also studied video journalism at KOS with videographer Jennifer Moran. 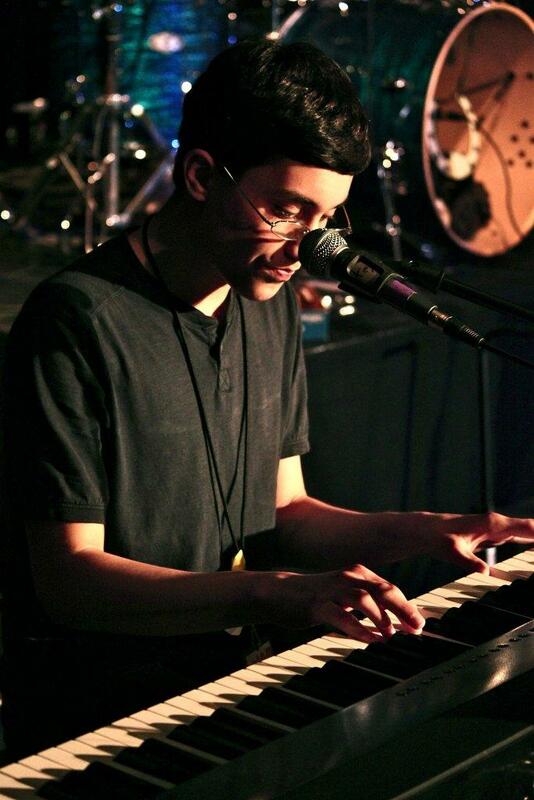 Like many students at KOS, Stanley moved on to the BGA JAM, a more concentrated music camp for teenagers, held each summer at Battleground Academy in Franklin. The Jam (www.bgajam.com) was started and is run by the indefatigable Laura Hill, who treats each of nearly 200 students like an artist on her label, carefully selecting them for the band and style of material they will work on for the week. Stanley played piano there, and volunteered to serve as M.C. for the concert that concludes each week of the camp. That's how Stanley became something of a sensation at Jam Camp, as he took the stage, assuming a gruff-voiced stage persona to draw excited cheers from the crowd. Jam Camp is also where Stanley met half the WannaBeatles, because David Toledo and Bloggin' Bryan are both instructors there. In addition, he knows WannaBeatle Dennis because the Karrs and the Scotts both attended The Temple. So when he began to think of a more serious project, like a documentary, The WannaBeatles seemed like a good choice. Stanley attended Currey Ingram Academy 5th through 7th grade, where he joined an after school club on independent film making. Zac Adams, an experienced videographer, "taught me how to work a camera," says Stanley. After home school 8th grade, Stanley entered Nashville School of the Arts, where he's been 9th through 12th grade. The WannaBeatles documentary has taken much of his senior year. He has posted it on his youtube channel, stanleykarrproductions. Stanley intends to submit clips from the documentary to the National Academy of Television Arts and Sciences, for a possible Student Production Award. 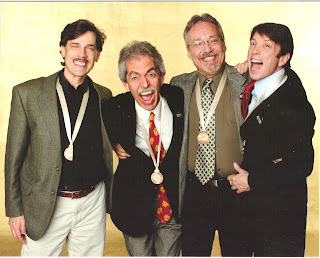 The ceremony for those Awards will occur in April at Watkins College in Nashville. Watkins College brings another WannaBeatles connection: their Film Dept. head, Steve Womack, helped turn our 2009 rooftop concert (a celebration of the final public performance by the Beatles on the roof of Apple Records in London, January 30, 1969) into a video. You can click here http://youtu.be/7PHDO9cliHY to see us performing "Get Back" on the roof of Rippy's in downtown Nashville, filmed by Watkins students, who are credited at the end, along with Steve Womack. Nice job, Stanley! Good luck with the Student Production Award. We're glad to work with you, and know we'll be seeing a lot more good stuff from you. On February 7, 1963, nobody knew history was being made. A company called Southern Plastics, located on Chestnut Street in Nashville, had pressed a vinyl record called "Please Please Me" for a Chicago label called VeeJay, by a group called The Beattles (misspelled on the label with two "T's"). The record didn't sell, and didn't get played on the radio. History doesn't announce itself and tell us to take notice. It just happens, as a part of the natural flow of everyday business. And it can get lost, unless someone comes along with the patience and persistence to retrieve the facts. February 7, 1963 - exactly fifty years ago - can now be remembered as the date of the release of the first Beatles record in the U.S., thanks to the efforts of a fan named Bruce Spizer. In his book "The Beatles Are Coming! The Birth of Beatlemania in America," Bruce writes: "For years, the official release date of the first Beatles single in America remained unknown, but a recently discovered document solved the mystery. In a telegram dated February 1, 1963, Vee-Jay president Ewart Abner informed publisher Concertone Songs that "PLEASE PLEASE ME BY THE BEATTLES WILL BE RELEASES FEBRUARY SEVEN." Southern Plastics is mentioned in Bruce's book, among three pressing plants that VeeJay used. In 1971, Southern Plastics changed its name to United Record Pressing. It's been at the same location since 1960, and has been doing very well, based on recent interest in vinyl. The WannaBeatles recently took a tour of United. We were led around by Jay Millar, their marketing director, who is very well informed. He explains the process of how vinyl records are made, along with some history of the factory, which has a "Motown Suite" upstairs, with an event room that hosted parties for such customers as Stevie Wonder, Hank Williams Jr., Wayne Newton, and the Cowsills. Here's a photo of Jay showing us the pressing machines. These machines are not made anymore, so United keeps full time machinists on staff, to fabricate parts that wear out and custom install them. They are operating 24 hours a day, to keep up with high demand. Being in that building, and discovering that the first Beatles records released in the U.S. were pressed there, made us want to release a vinyl record of our own, as a 50th anniversary tribute. As we looked into the possibility, the practical questions of how much it would cost, along with how much time it would take, outweighed the thrill of making our own vinyl record, even with the historic connection. But it sure makes a fascinating idea. United is a great, if underappreciated, example of Nashville's role in pop music history. 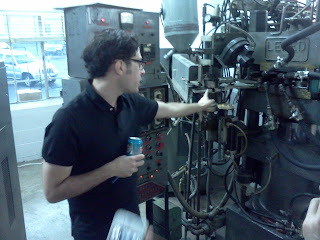 We would highly recommend touring the plant for anyone interested in pop music history. They charge $5, but there's nothing like it. And Bruce Spizer is a great resource for information on the Beatles recording career. He's now published eight of these books. You can find out more about him at http://beatle.net/meet-bruce-spizer. And we're proud to say Bruce appears on our "Fab Fan Memories" CD, telling his own story of eating macaroni while watching the Beatles on Ed Sullivan. It's the only mention of food on our CD, but then Bruce is from New Orleans, so that may explain it. Fifty years ago, something happened that didn't look important at the time. But fifty years later, we all can see that it was the beginning of something that affected millions of people. Lots of girls were screaming, and lots of guys decided they wanted to be in a band. And so the WannaBeatles are part of that story, and happy about it. It's February 1, there's a little snow on the ground in Nashville, and it's an exciting time to be the WannaBeatles. We're working on a new album, putting up a new website, learning new instruments and new technology. Tomorrow is Ryan's Bar Mitzvah, a once in a lifetime occasion and gig, when Dennis's son will celebrate his manhood and play "Come Together" on drums with us. 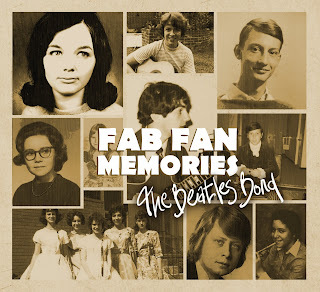 "Fab Fan Memories" is a collection of interviews with Beatles fans. Among the participants who contributed was Janis Ian. She spoke about being at camp at age 13, being "dragged" by her bunk mate to see the movie "A Hard Day's Night." "The music was unbelievable," she says. You can hear her story on the youtube version of the album, (click this link: http://youtu.be/vzVDE27mz70) starting right after the four minute mark. Because Janis participated in our CD, we were delighted to hear the news that she was nominated for a Grammy this year in the same category: Spoken Word album. It's an audiobook version of her autobiography, with her own voice reading the complete text of "Society's Child," which came out in 2009. The title comes from her first hit record, which gained attention, and controversy, in 1967, by daring to mention interracial dating. Her book opens with a description of a concert in Encino, California, where protesters shouted at her as she tried to sing the song. She retreated in tears to the dressing room, where the promoter asked her to go back onstage, if only to establish a victory over the protesters. It was a very dramatic moment for a teenage folk singer, and she tells the story very well. 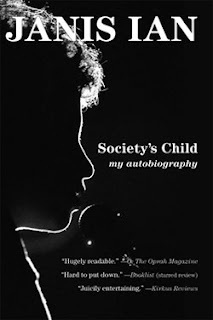 A few weeks ago, Janis did a book signing at Parnassus Books, on a rainy Sunday afternoon. The place was packed. Parnassus is another local treasure, a bookstore started by author Ann Patchett. When Davis-Kidd closed, there was a void both economic and cultural in Green Hills, but Parnassus has more than filled the gap, and restored vitality to the neighborhood. So the WannaBeatles take advantage of not being nominated for a Grammy this year by working on our new album, writing our blogs, developing our website, and improving our show, and congratulating our friends who are doing well. We even made a little video, using a Chuck Berry hook and Nathan's pounding piano licks to say "Go Janis!" in our own WannaBeatley way. As we discovered last year, being nominated for a Grammy is plenty of excitement. If you don't win the Award, it doesn't mean you haven't accomplished something. We hope Janis wins. She's a winner in our book.